The species has a widespread but patchy distribution in southern England and south Wales. It is widespread in western and central Europe, but has not been recorded from Finland. The spider occurs on heathland and in open woodland. 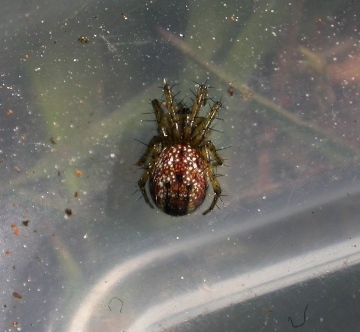 It can usually be found in the centre of its small but densely woven orb web, which is constructed on low vegetation such as heather and gorse. The few sites in Worcestershire where it is found suggest that it prefers drier places. It is mature early in the season, adults occurring mainly from May to June. The spider may be numerous in parts of the south of England but seemingly inexplicably rare in other areas. Fragmentation of landscape areas supporting populations through agricultural intensification and loss of suitable semi natural habitat is the most likely threat. Maintain open woodland and heathland through rotational management that provides a continuity of vegetation suitable for web building.